Learning to grow hydro is awesome! When you’re just starting out, the amount of systems and set ups can seem overwhelming. Aren't you glad you have us to help you out? Today I’m going to show you the best hydroponic system for weed, some tips on growing hydro and how it all works. What Do You Need to Grow Hydroponic Cannabis? Which Hydroponic Growing Medium Should You Choose? A common misconception is that growing hydroponically means growing in water. It’s actually growing in a water based medium. While you can grow in nothing but water, you can also grow in perlite, vermiculite, Rockwool, clay pellets or peat moss. The basic idea of hydroponics is you’re creating direct contact between the nutrients and roots. Hydroponics provide more oxygen to the roots compared to soil. And more oxygen makes for healthier roots and plants that grow bigger, faster. The coolest part of hydroponics? How much water it saves—crazy, right? When grown hydroponically, cannabis doesn’t have to try so hard to obtain the nutrients it needs. Since you’re using an enclosed hydroponics system or a medium that retains water extremely well, you’re able to use up to 90% less water than you would growing in soil. Plus, these systems don’t put soil run off into the environment. You can also grow more plants in less space, up to 4x in some cases. Allowing the plant to spend more energy developing from the roots up, instead of trying to build a huge root system. Growing hydroponically is not all that different from growing in soil. You need all of your essential gardening gear and a hydroponic system. As you can see, you don’t need much to get started growing cannabis. If you’re worried about discretion, then you’ll probably prefer to buy your gardening set up online instead of going to your local hardware store. If you’re just starting out, I recommend you spend a little bit of time in the research phase, but then quickly jump into action. Be prepared to make mistakes, kill plants and experience lackluster yields. 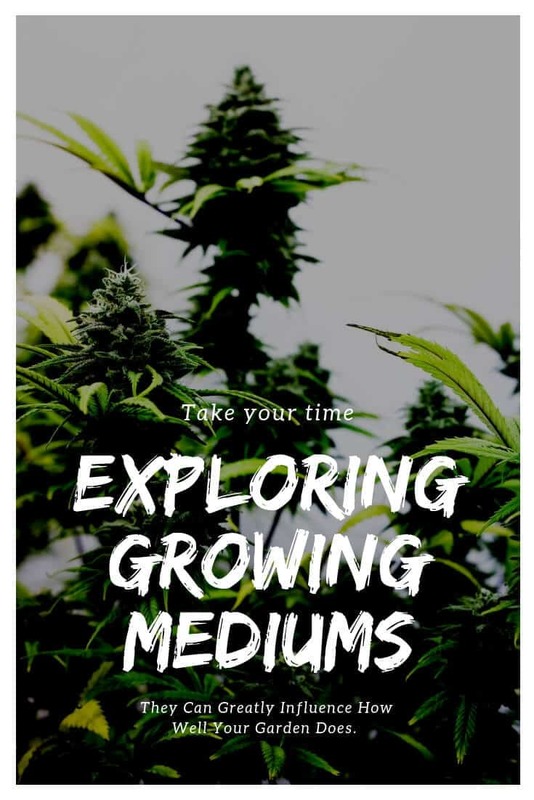 Mastering growing is a long process, but anyone can learn. For starters, what a plant needs doesn’t change just because it’s in water instead of soil. You need a firm understanding of what to feed your plants. Read our full guide on cannabis nutrients here. Setting up the lights in your grow room is essential to maximizing your yield. Read our guide on setting up your grow lights here. Ventilation is often overlooked by beginning cannabis gardeners but is invaluable. Read our guide on grow room ventilation here. Another often overlooked detail of growing is the pH. And trust me, keeping an eye on your pH is the difference between a good yield and a GREAT yield. Read all about cannabis pH here. After you’ve learned how to set up your grow room, you should move on to learning more about the plants. Learning the various stages of plant growth is vital, read all about it here. There is a ton to growing good cannabis, but if you read all of those guides, you’ll be well on your way. There is no right or wrong hydroponics system to go with. Some work better for small time growers that can only grow a plant or two in their closet, while some are better suited for full scale grow ops. If you’re just starting out, learn about and master one of the different types of hydroponic systems before trying anything else. Deep Water Culture is easily the best beginner hydroponic system—mainly because it’s the easiest to use. Your plants are suspended in a nutrient solution which is being pumped full of oxygen like an aquarium. Without the aquarium pump running into the water, your cannabis plants would drown. To help create more oxygen in the water and air stone is often used. This system, in particular, you need to keep light from getting in, or else say hello to algae, root rot and god knows what else. This is also the best style of hydroponic kits for beginners. Also called flood and drain, ebb and flow works by flooding the growing area with nutrient rich solutions at specific time intervals. After it’s flooded the area, the solution then drains slowly back into the reservoir. You have your pumps hooked to a timer, so the process is automated to exactly when you want it. Usually, growers have the trays flooded 2-3 times a day for a few minutes each time, but it all depends on what stage the plant is in. After the solution drains, your roots can absorb a bunch of oxygen until the next flood. An ebb flow grow system is one of the harder methods and should only be used by advanced growers. A hydroponic drip system is how I learned to grow hydroponically. I used bags of vermiculite, but you can use any medium that has high water retention (Rockwool, coco coir, peat moss). You can use a faster draining medium, but you’ll have to drip at a faster pace so I can’t recommend it. The idea is that your nutrient solution slowly drips into the medium continuously feeding your plants without drowning them. One of the cool parts of using this hydroponic system is that after harvest you can recycle the growing medium in your garden. The downside to this system, though, is that the small drip lines can get clogged from nutrient buildup. It’s easy to fix, but something you have to keep an eye out for. A drip hydroponic system is an easy way for you to learn how to grow hydro. NFT systems use a small layer of water that runs over the roots on a downward slant to feed your plants. It’s a continuous flow of water that uses gravity to run over the root tips. This means the rest of the roots are exposed to oxygen which can cause faster growth. This method is outdated, though, and you’d be better served with one of the others especially if you’re just learning. Aeroponics is probably my favorite hydroponic system simply because of how neat it is. The roots are suspended in air and misted with a nutrient solution (think growing in fog). Some systems use a fine spray nozzle to create this fog, while some systems use a pond fogger. Like I touched on earlier, hydroponics doesn’t mean you have to grow directly in water. There are a ton of different mediums that can be used (some easier to use and better than others). Perlite looks like tiny, white, rounded specs and is widely used in gardening. In fact, most soil mixes contain a huge chunk of this stuff because of its water retaining capabilities. It’s an obsidian that is characterized by spherulites that are formed by the cracking of volcanic glass while it’s cooling. One thing to note about perlite is that it’s non-organic. But not everything non-organic is inherently bad. Vermiculite and perlite are often used interchangeably, but they are very different. Vermiculite is hydrated laminar (aluminum-iron magnesium silicate). It’s processed using so much heat that it expands into pellets with a bunch of thin plate-like layers. The cool part of these growing mediums is they won’t rot, deteriorate or mold, and they are non-toxic. Rockwool is another favorite that’s a lightweight medium made from spinning molten basaltic rock in fine fiber. These fibers are then woven together to form all kinds of different shapes like cubes and slabs. Like perlite, Rockwool is a product of man wielding nature into a fantastic growing medium. Clay pellets are made by heating clay up to 2,000°F in a rotary kiln. Doing so fills the clay with little air bubbles that are perfect for holding oxygen and water. Pests don’t like them, and they won’t affect your pH making them an excellent choice. If you ever decide to start growing with another medium, your old clay pellets can be thrown into your soil garden to add aeration! Coco coir is one of the best choices for the environmentally conscience gardener. Made from the husk of a coconut, it’s a natural product that is made from waste instead of being harvested like peat moss. If you grow with coco coir, you’ll almost feel like you’re growing in soil, making it a good hydroponic medium to start with. And it’s pretty pest resistant, which is an added bonus. The water temperature is important. You want to to keep it in the sweet spot to reduce the risk of root rot. Plus, when the temperature is too high your oxygen will be quickly depleted, and water that’s too cold can shock the plants. If you’re having trouble maintaining the right temp get an aquarium heater or chiller. Of course, the pH needed will depend entirely on the strain, but when growing hydroponically, you want to keep your pH closer to 5.5. If you buy seeds from a trustworthy seedbank, then they should give you instructions on the pH your strain will want. When you grow hydro, your cannabis will quickly deplete any available CO2. To combat this, you need to create a steady flow of CO2. You can either buy a generator or easily rig up a homemade one, but either way, you want your grow room to stay at around 1500 ppm. If you’re growing with organic nutrients, be sure to add microbes to your reservoir. They break down the nutrients making it even easier for your roots to absorb them. Not only will it soften your water, but it reduces calcium and magnesium build-ups. You can use a TDS meter to measure the nutrients in your reservoir. Exposed reservoirs entice mold growth. It’s the light on a wet surface that’s the culprit. So, be sure to keep it closed! At least every two weeks you want to completely drain your reservoir and replace all of the nutrient solution. You can reuse the discarded water on your outdoor garden by diluting it. You never want to give your water pumps a chance to draw air. Keeping your reservoir at least above half-full will help avoid salt build ups and keep your pH in check. 10. Don’t Forget to Flush! During the week before harvest, switch your water out for a plain pH balanced water. Doing this flushes the roots and plant of excess salts and nutrients making your flowers both smoke and taste better. The number one way to help curb root rot is to add beneficial root bacteria. Not only does it help prevent root rot and many other diseases, but it also makes the nutrients more readily available to your cannabis. But, that’s not all you can do to prevent this devastating disease. To stay on top of it, you need to remain in complete control of your water temperature, light and the oxygen in the water. Warmer reservoirs promote bacteria growth, so be sure to keep it in the 60-70° sweet spot I touched on earlier, and prevent light from reaching it too. Also, keep your water agitated and loaded with oxygen to not give bacteria a chance to settle in. Another easy way to avoid root rot is to keep plant matter out of your reservoir. It’s easy to let old leaves wind up in your water—don’t. You’ll be crying over smelly brown roots if you do. I have to give the title of best system to this DWC kit by Power. It’s a pretty big kit that allows you to grow four plants at once. 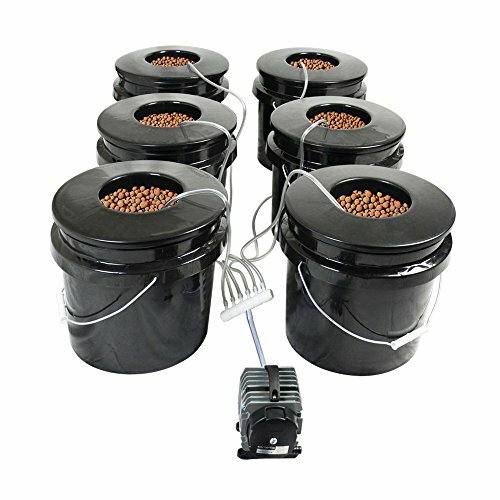 You'll be getting a complete kit with this hydroponics system. It comes with almost everything you need: Air pump, air lines, air stones, 10" basket lids and 5-gallon buckets. You will need to pick up the growing medium of your choice like clay pebbles or Rockwool. The coolest part of this system is that it comes with a water level indicator plus a drain making water changes super easy. It’s also shipped discreetly which is a big plus when starting an indoor garden. If you’re worried about the pump being loud, don’t be. It’s a just a low-level hum that would be hard to hear from the other side of a closet door. Since there is no centralized reservoir, you’ll want to change out the water at least every week. If not, a system like this can clog up from a nutrient build up quickly. The pump is strong enough to get enough oxygen to all four buckets, and the airstones it comes with helps build strong root systems. 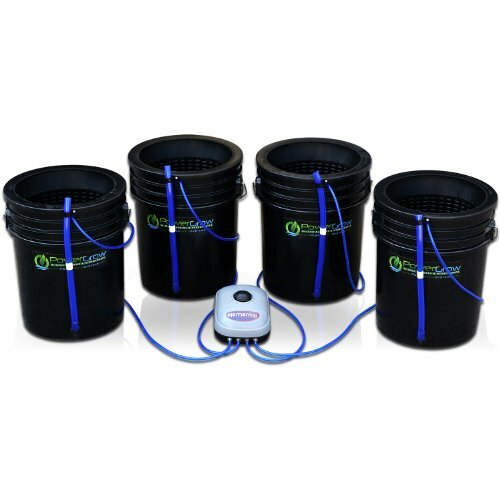 Overall, this kit is perfect for growing cannabis and easy way to dip your toes into the waters of hydroponics. If you were thinking, "Whoa! Four plants won’t fit in my grow room," then this hydroponic system is your choice. Who other than General Hydroponics, one of the powerhouses of the hydro market, would come to market with this beauty. GH tends to put out the best hydroponic systems that always produce large plants. It’s a single plant system, so it’s perfect for the urban gardener with limited space, and it comes with everything you need to grow—it’s really a plug n’ play. It even includes some of my favorite hydro nutrients! This kit is light proof, so you don’t have to worry about algae or mold. Plus, you’re able to see the water level without removing the lid. 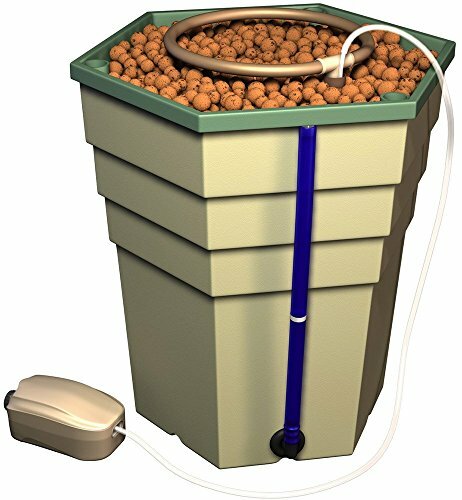 It’s four-gallon reservoir, and two-gallon growing chamber will give your roots plenty of room to develop too. Its new, adjustable, pump allows you to crank up the oxygen when your roots are mature. Could have a better pump, although they did just upgrade the kits pump to an adjustable pump. If you loved the sound of our top choice, the DWC Kit by Powergrow, but only have enough room to grow a single plant, then here you go! You get everything you get from the bigger kit, except it's only one bucket vs. four. With the added bonus that this kit includes the growing medium, you need too. You’re not losing any features; it’s just shrunk down to fit a wider variety of needs. But, with a smaller system like this, you might opt to DIY for much cheaper. If you’re looking for a hydroponic system that’s going to yield the most, then you need to grow more plants! 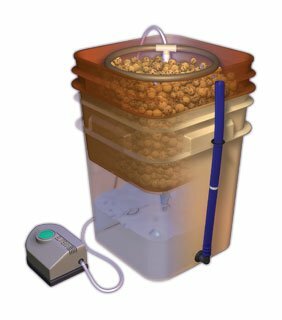 This system comes with six 3.5 gallon buckets, net pot lids, large airstones and a powerful air pump with a six-way divider. 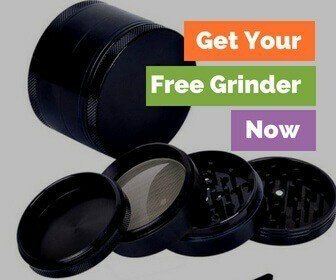 The kit is easy to set up and comes with everything you need to grow. The huge bag of clay pebbles it comes with is the perfect amount to fill your nets. Its air pump is pretty big; it has to be to run six buckets after all. But this also means that it’s loud! So, don’t expect this to be a good closet system. Also, the kits air stones aren’t as big as you’ll need if you want to enough oxygen for large plants to grow. Another great hydroponic system from General Hydroponics. This system is a single plant system shaped like a hexagon allowing you to pack them close together in your grow room without wasting any space! It has a massive reservoir—5.7 gallons. This allows you to grow massive plants! 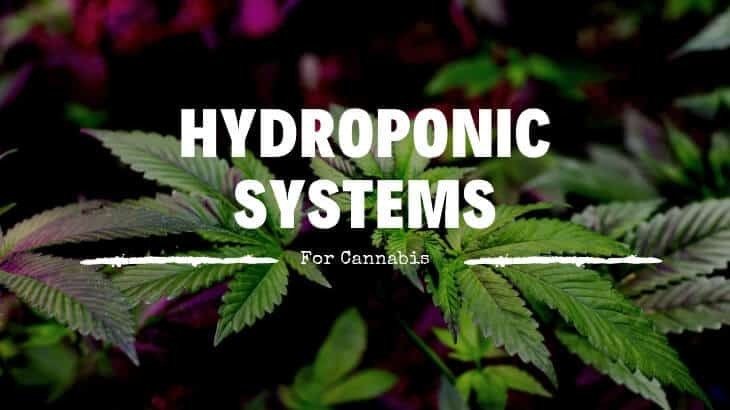 The system also comes with a 3-gallon growing chamber, pumping column, drip ring, drain level tube, air pump, Hydroton rocks and their 3 part Flora series nutrients. This is perfect for the beginner hydroponic grower. Everything you need in a simple, self-contained system. Its container is thick and light-proof protecting it from algae. Unlike most of the systems on our list, this one is not a deep water culture system—it’s a drip system. The hoses are thick and blue, which makes it a tad bit hard to see the water levels of the reservoir, but other than that this an almost a perfect starter system. 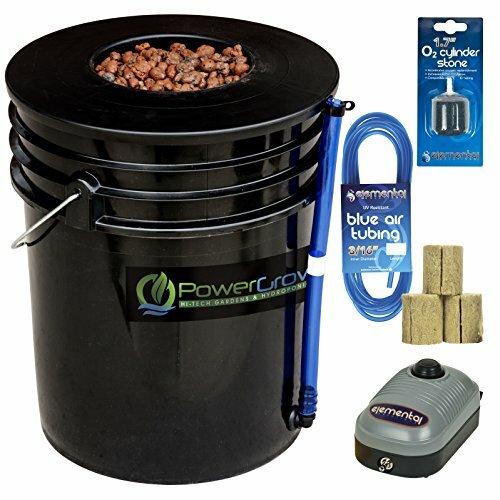 Learning how to grow hydro doesn’t have to be intimidating. With the best hydroponic system for cannabis and the knowledge you gained in this article, you’ll be growing fat buds in no time. Do you have a favorite hydroponic system?